Are you tired of spending countless hours vacuuming your floors and your upholstery to get rid of shed pet hair and dander? You got a deshedding tool but cleaning it seems to be endless? We got the solution for you..... The Boshel® easy-clean Dog Grooming Brush & Pet Deshedding Tool! With the Boshel® easy-clean Pet Deshedding Tool it's easy to put a stop to the hassles without saying goodbye to your furry family member, by greatly reducing shedding and helping your dog look and feel her best! ★ The Boshel® grooming brush for dogs and cats uses a 4-inch stainless steel deshedding comb head to remove loose fur before it falls off of your pet. ★ The Boshel® deshedding tool design is guaranteed to reduce shedding by up to 93%. ★ The grooming tool features an ergonomic easy-clean button which allows you to remove all the gathered hair with just a click of a button. ★ While the deshedding brush dramatically cuts down on shedding it also effectively removes mats and tangles. ★ The pet grooming tool is ergonomically designed with a comfortable non-slip rubber handle to give you a great grip while grooming your furry friend. Free yourself from the hassles of vacuuming and sweeping up excessive amounts of pet hair for good with the best quality, easiest-to -clean deshedding brush on Amazon! Order the Boshel® Dog Grooming Brush & Pet Deshedding Tool today. 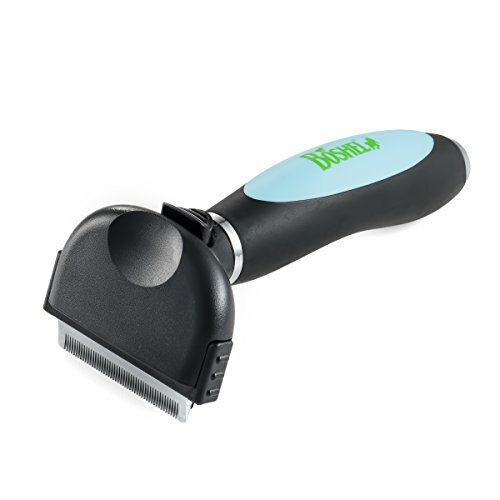 ★ EASY TO CLEAN - The Boshel® grooming shedding brush is uniquely designed with an ergonomic easy-clean button to effectively remove all the gathered fur with just the click of a button. ★ COMFORTABLE - The Boshel professional deshedding tool for dogs and cats features an ergonomically designed comfortable non-slip rubberized handle. If you have any questions about this product by BOSHEL, contact us by completing and submitting the form below. If you are looking for a specif part number, please include it with your message.